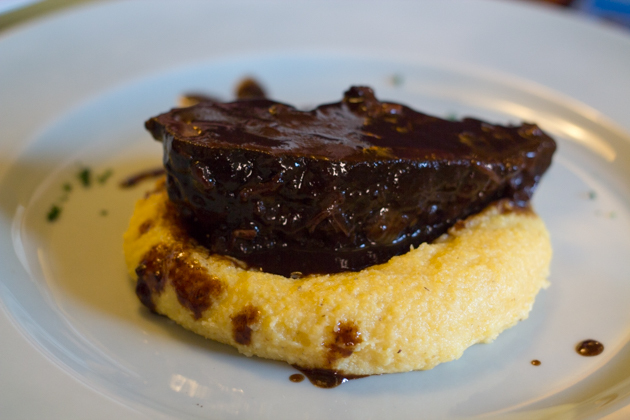 Brasato al Barolo is a signature dish of Piemonte. 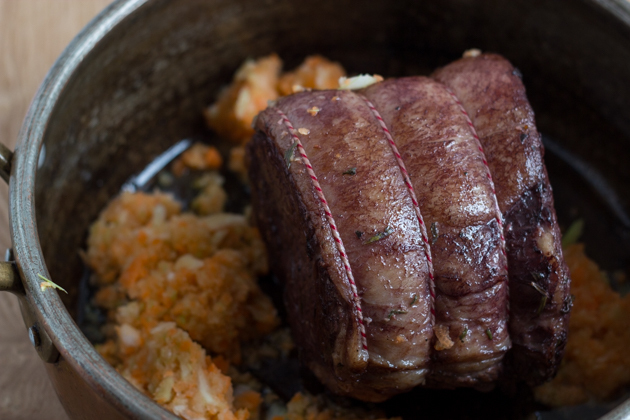 The key to this dish is using the correct cut of beef. It will make the difference between melt-in-your-mouth tender and mushy-and-tasteless. 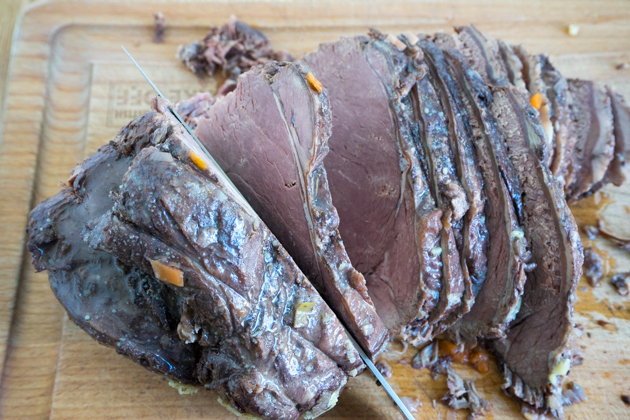 Make sure you get a decent sized (minimum 1.5 kilos) from the beef shoulder (chuck roast or chuck and blade). I prefer to cook this in my slow cooker (see notes). It requires a bit of advance planning but the amount of time cooking is actually minimal. Two to three days before I want to serve the dish, I take 10 minutes to marinate it. The following day, I cook it on low in the slow cooker for 8 hours then cool and refrigerate it. 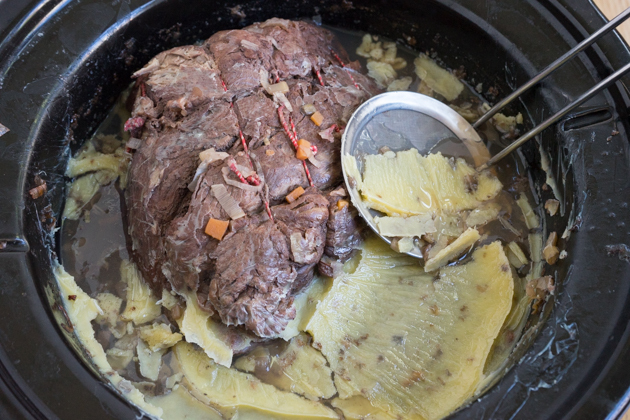 The final day, I remove all the solidified fat, slice the beef and reheat it in the liquid to serve. Serve this with peas, carrots cooked in butter or Marsala wine or mashed potatoes. Place all the ingredients except the olive oil in a ziplock bag and place in a bowl. Refrigerate overnight. Drain the meat and pat dry. 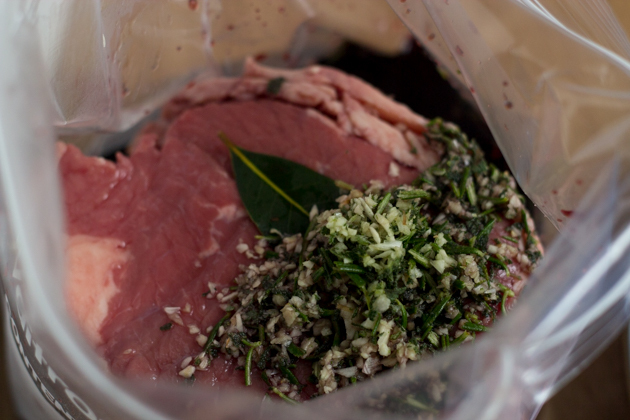 Strain the marinade and reserve the red wine separately. Heat the olive oil in a large, heavy bottomed saucepan or Dutch oven over medium heat. Add the meat, to brown the outside, turning every 2 minutes until evenly browned all over. Add the strained vegetables and aromatics to the pan and cover. Cook until the vegetables are soft, 10 to 15 minutes. Reduce the heat to low. Add the wine to the pan and cover. 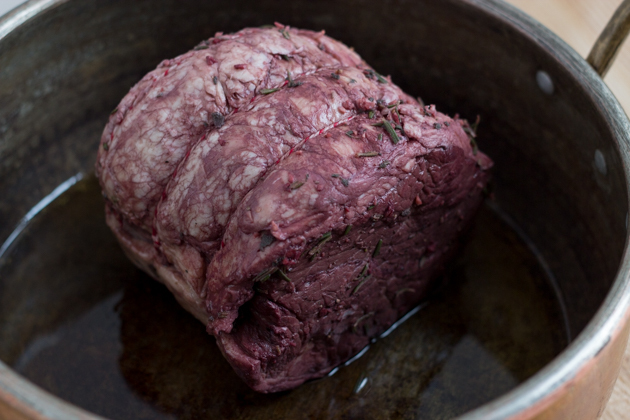 Cook for 3½ hours or until it falls apart with a fork (90C/ 185F internal temperature). 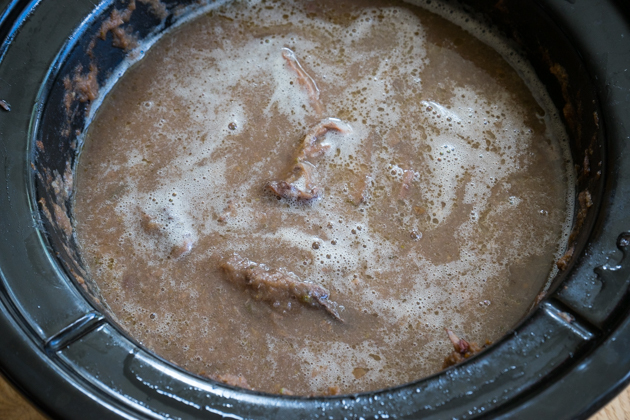 If you are cooking this in a slow cooker (see the notes). 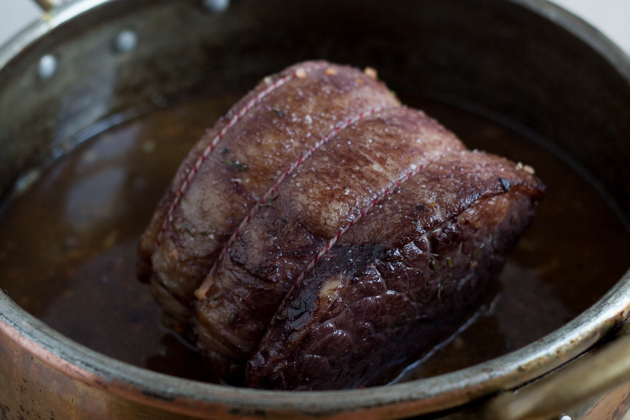 If you are serving the beef the same day, remove it from the liquid but keep it covered. Discard the cloves, bay leaf, sage, rosemary and peppercorns. Puree the sauce and add the saucepan over high heat until reduced so that it is thick. Slice the beef and serve in the sauce. Puree the sauce and reduce it over high heat until thick. Reduce the heat to low. Add the beef to the sauce to reheat, 30 to 45 minutes. Please buy a medium bodied red wine that you like the taste of but does not cost a lot. It would be a waste to cook with an expensive Barolo. At the same time, if you buy a wine that is so cheap that it tastes terrible, the beef will be wasted. If you are using a slow cooker. Brown the meat and saute the vegetables in the saucepan (or your slow cooker if it offers this function). Set aside the rosemary and sage. Move everything else to the slow cooker. Add the red wine to the saucepan and bring it to a boil for 10 minutes to cook out the alcohol. 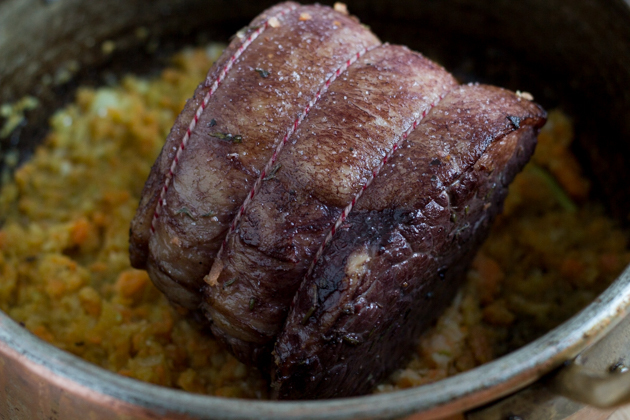 Add the red wine to the slow cooker and cook everything, covered for 8 hours on low. 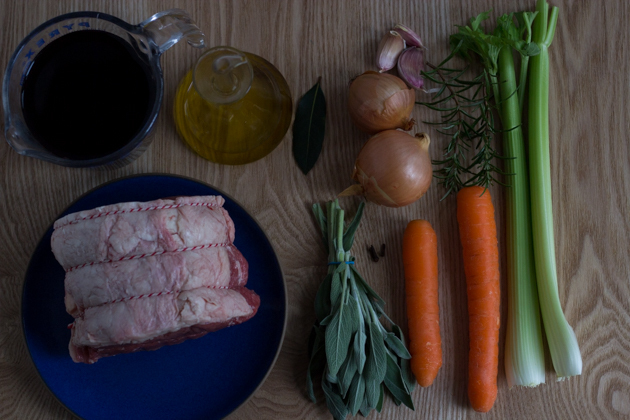 The last hour of cooking, add the rosemary and sage back to the slow cooker.